Horses prefer certain food too ! The nutrition is a crucial factor to the development of the organism for both men and animals. Human beings and animals are the two species cohabiting in this Earth, but they are far diferent. They are not only diferent by their appearences, their metabolisms are diferent too. A correct and balanced diet, specially in animal epecies, is fully advised because it conributes to better performances of the organism. Horses are typical examples. In this blog you will find informations about Horse food the way you should feed your horse and adequate supplements promoting its growth. 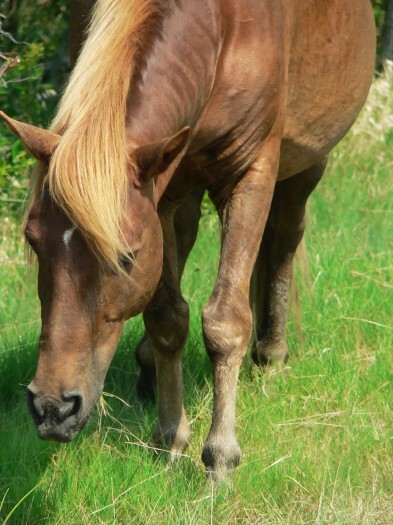 Horses are grazing animals, non-ruminant herbivores, specially living on a diet of hay and pasture that are their staple diet. However, feeding your horse exclusively with these two food could be poor or insufficient because they lack some substances essential for their growth and their performances. Even though the amount of food that a horse requires depends on its age, you always have the possibility to vary its diet by alternating the hay and the pasture with supplements that would provide hiqh quality of nutrition and quick source of energy. Concentrates are very used by horse owners for their complementary quality. Concentrates for horses are gains like oats, corn, barley and beet pulp. They are efficient when it comes to nurture a pregnant or nursing mare and a highly active horses. Mixing these grains with molasses also provide a more sufficient nutrition. It is a fact that horses like fruits and vegetables, specially apples and carrots that are their favorite ones in this category. Other aliments, other ways to feed your horse are available in our Blog. Whatever the nature of your horse, its age or its activities, we will provide you the best products of nutrition, good advices that would allow you to keep your horse healthy and very productive as well. Does a saddle must be adapted to the horse or horse rider ?